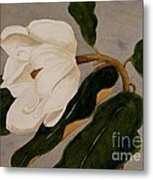 Love the elegance of your Magnolia paintings! Watercolor was my first love....and these were painted from the flower in front of me...never from a photograph. And the perfume...a wonderful experience! I had taken two courses in botanical art at the LA Arboretum...my instructor was an ex Forest Ranger and a botanist...a petite feisty woman....quite exceptional. She certainly inspired us! Thanks so very much Dora for this lovely feature in Visions of Spring. I'm so happy to show off this watercolor. It's one of my very favorite paintings. 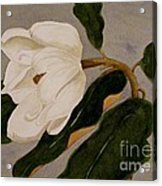 Beautiful painting of a lovely and delicate Magnolia blossom! Nancy, I invite you to post this fine artwork to the Visions of Spring - Glances of Summer Group. It will surely make a great addition to that Group. F/L. Loved you visit and comment, Dora! I did post this one to your group. I'm so pleased that you liked my magnolia. I really was so entranced with this flower for ...years! This is deliciously beautiful ... lovely graceful lines ... wonderful colors!!! Thanks so very much, Lois. I fell in love with magnolias and painted so many....all in watercolor. Spectacular Nancy! I love the movement and dance you have conveyed in this lovely magnolia... she's showing us a bow, if you will. I love it! It was so nice to read your biography and know that you are a dancer. I took lessons from age 3 and was briefly on toe in high school. Never very good at it, mind you, but I know that it has made a difference in my painting skills and my heart. I read that in your art as well! Well, no...not age 3....more like age 5. I remember the little recitals and the wonderful costumes! Also tap dancing!! Thanks so much, Marcia. I always thought I should have tried for an exhibit of these, but so far I haven't. I'm thinking about making them a nice box of cards though. !! This was the only "pose" I chose to try in several styles and backgrounds. I really liked the graceful flow of both petals and leaves! 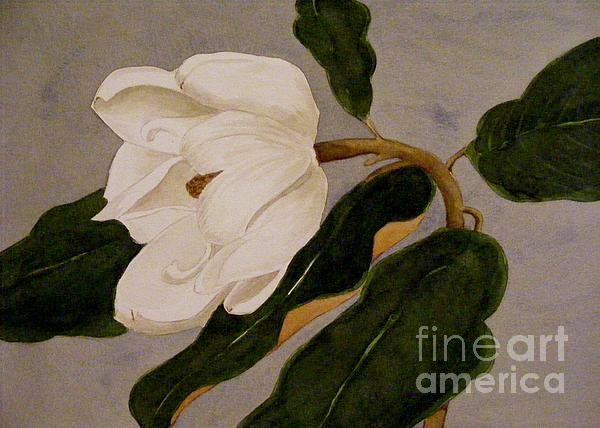 I took classes at the Los Angeles Arboretum from a botanist...I learned so much...but as you can see, I seemed to love painting magnolias best! Thank you Randi for this praise. I stopped by your site and it was filled with beauty! Thanks you so much for your praise. I had so much pleasure viewing your wonderful watercolors. You are so talented!! Thanks for your praise of my magnolia. As you can tell, I really enjoyed painting these flowers and there are several trees in my neighborhood now and I'm already thinking of maybe doing just.....one more! Thank you, Jane for your comment. I was taking a course from a botanist and I did keep straying off the path of exactitude and felt, like you noticed, that the flowers had personalities. And maybe I put my own moods into them, too. I have so enjoyed your paintings. 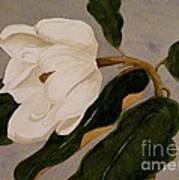 This magnolia watercolor was one of my favorites and I painted it again and again with various backgrounds.